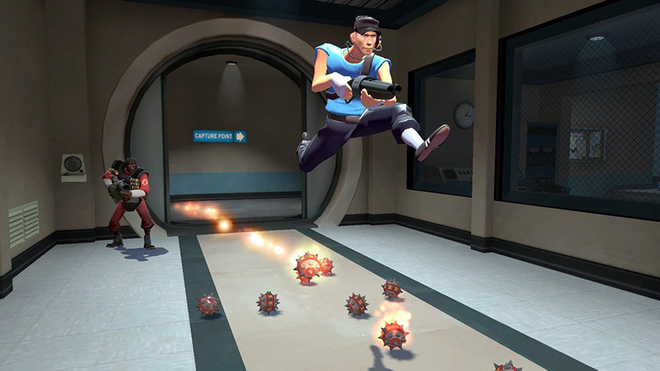 Valve has had tremendous success selling games like Team Fortress 2 on its Steam digital distribution platform. The game publisher Ubisoft set off no small amount of controversy last year when it began shipping its PC games with a restrictive digital rights management scheme that forced customers to stay online in order to play. Should Ubisoft be taking advice from pirates? Game publishers have spent the past two decades dreaming up new ways to combat piracy. Sometimes that DRM software cripples the game for legitimate users while only providing a tiny roadblock for pirates. Gabe Newell, CEO of Portal 2 publisher Valve, says that publishers have it backwards. They should use the carrot, not the stick, and reward people for doing the right thing. In other words: Focus on the game, not the DRM. Ubisoft’s plan isn’t working. Even after taking these drastic steps, the company says that 90 percent of the people who play its games are playing them illegally, according to Wedbush Morgan analyst Michael Pachter. But how many people only used piracy as a way to bypass the DRM? How many of those pirates might have purchased PC copies of games like Assassin’s Creed II if they could be played without an internet connection? The people who are telling you that Russians pirate everything are the people who wait six months to localize their product into Russia. If a player has a shoddy, unreliable Internet connection — or if he wants to play Assassin’s Creed II on an airplane, for example — might he just be forced to download a cracked version? Gabe Newell, whose company runs the Steam digital game service, insists that this is in fact the case: Gamers often pirate for convenience, not finance. Despite a disproportionate amount of software piracy in the country, Newell says Valve has transformed Russia into one of its largest markets. Steam has revolutionized the way people buy and play games. It’s not just a digital storefront. Steam encourages customers to buy games, share them with friends and compete online for achievements. For those players, it becomes more fun to buy games than pirate them. Much of Valve’s success comes from its willingness to break with tradition if the data says so. Speaking at the Games for Change conference in New York City earlier this year, Newell said that his company’s every step is carefully researched and planned, guided by the immense amount of customer data they mine every day. “We use the fact that we’re connected to 30 million users in order to measure the consequences of everything we do,” Newell said, noting that any game publisher can use the company’s Steamworks service to tap into data about how customers are behaving, then act accordingly. If PC publishers dig into that treasure trove of data, or even just start asking random strangers on the street, I think they will discover what Newell did: Game pirates are willing to spend money for better experiences. As long as there are birds in the sky and tubes in your computer, there will be piracy on the Internet. But by using positive rewards rather than negative punishments, publishers might be able to not just lock out thieves, but convert them into paying customers.